Gregg, my friend Laura (from San Jose, CA) and I went to Long Beach this past weekend to buy a new sofa for the front living room - and on the way there, I was lucky enough to get to sit in the back of the car and finish the hat I made for my Warm Winter Exchange pal! 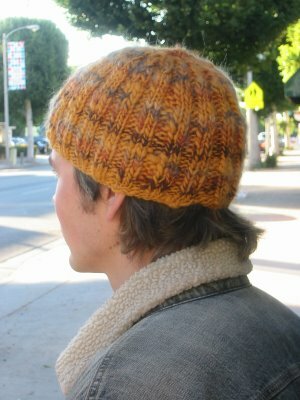 (I hope he doesn't look at my blog; although the chances are pretty slim that he will) - I made this hat with manos wool from Uruguay, and added in mohair that I bought from turkey to create the different stripe colors. I am really pretty proud of the hat; I think it turned out really well! My friend from work, Mike, modeled the hat for me so that I could get a good photo of it before sending it off. We were next door to my work to do our "photoshoot" - I think I am going to make something else for my pal before shipping everything out around December 10 - the exchange thing is fun - I love making pieces for people almost as much as I love mailing out packages! Kyle, I like the Hat,good job. The model looks pretty good too. Lars.